College students consider a number of factors when choosing their majors. They assess their interests and skills, and match them to potential careers. Degree programs vary not only in the subject matter of the course work, but also in cost and the number of years required to graduate. If the potential for earnings was the only consideration, everyone would major in engineering. There would probably be more medical students if the process did not require so much money and time. Equalizing all salaries would quickly solve the teacher shortage. At last report, 42 percent of students chose one of 10 majors, according to the Business Insider. These degree programs concern business, health care, education, and a few other fields. Here is a look at the most popular college majors, and the top-ranked schools offering them. Eight percent of college students in the United States were majoring in business management and administration, when the Business Insider conducted its most recent survey. Degree programs in general business and accounting each attracted about 5 percent of students, placing them second and third on the list. Another business program, marketing and marketing research, ranked seventh with 3 percent of students. Business majors take classes in subjects like accounting, marketing, finance, economics, statistics, budgeting and business planning, and employee management. The careers they seek require good math skills, as well as strong interpersonal communication. According to Bloomberg Business Week, the best place in the United States to get a business degree is the University of Chicago’s Booth School of Business. Others in the top five, in order, are the Harvard Business School, the Wharton School at the University of Pennsylvania, the Stanford Graduate School of Business, and the Kellogg School of Management at Northwestern University. The fourth most-popular degree program is nursing, with about 4 percent of all students. Nursing requires a wide range of skills, from the technical to the personal. Nurses must deal with highly stressful, traumatic situations. They are trained to assess, diagnose, and treat injuries and illnesses, while working under the supervision of doctors. In their freshman year in college, majors in this field take classes in the sciences and liberal arts. As sophomores, they begin clinical rotations to gain training and practical experience. Later, nurses may specialize in oncology, neurology, pediatrics, or obstetrics. According to rankings compiled by U.S. News and World Report, three schools are tied for the distinction of having the best nursing program. They are St. Johns University in Baltimore, the University of Pennsylvania in Philadelphia, and the University of Washington in Seattle. Next on the list are the University of California at San Francisco and the University of North Carolina at Chapel Hill. Psychology degree programs also attract about 4 percent of students. Classes cover complex subjects related to the workings of the human brain. Students learn about intelligence, perceptions, emotions, personalities, and learning abilities. They diagnose and treat mental disorders, and help patients cope with emotional challenges. Getting a degree in psychology is just the beginning of the educational requirements to work in this field. A graduate degree from a medical school, as well as training and certification, also are required. The Social Psychology Network reported that Stanford University has the best undergraduate program, based on a Princeton University report. Others in the top five are Yale University, the University of Pennsylvania, the University of Michigan-Ann Arbor, and the University of Minnesota-Twin Cities. Elementary education majors make up about 4 percent of students, while about 3 percent pursue degrees in general education. While not among the higher-paying professions, teaching provides opportunities for other rewards. Inspiring children to learn can be highly gratifying. Students majoring in education take mostly general-education courses, with some class work focusing on the grade levels they expect to teach. While in school, education majors frequently serve as student teachers to gain training and experience. Michigan State University has the top degree programs in education, according to Campus Explorer. It ranked Pennsylvania State University second, Ohio University third, Vanderbilt University fourth, and the University of Georgia fifth. These are the most popular college majors, and some of the institutions renowned for their degree programs in those fields. Pursuing these studies can lead to rewarding careers in a variety of disciplines. Considering choices other students make can be instructive. However, it isrecommended that students focus on their individual needs and interests. Making money is not the only objective. Finding something that you can imagine yourself doing, in a full-time career, should be the main goal. 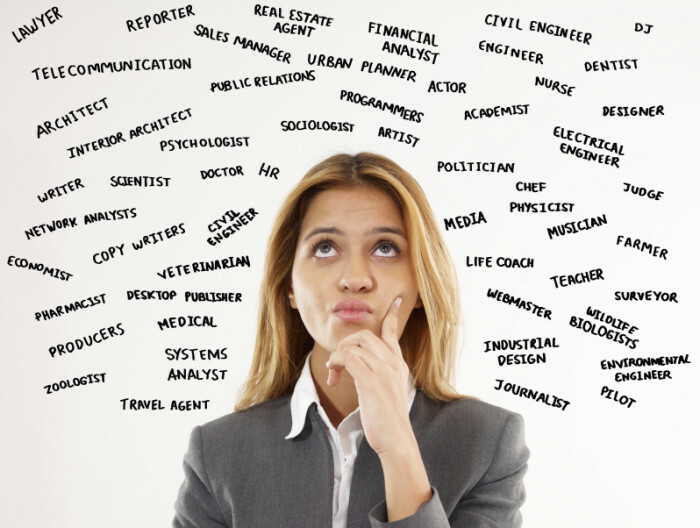 An important aspect in choosing a career, which will help you settle in your practical life more easily, is understanding your personality and your interests, preferences, passion and applying it to your career choice. This will make you love your job, and settle in easier. There are many ways to learn and understand your personality type. There are many tests available online which give detailed description of the results and are not really hard to understand. You should be honest in answering the questions. You can also consult your career counselor and they can conduct a test for you and share the results. They will also let you know about possible career choices based on your personality type. One of the most popular and widely used tests to assess personality types is the Myers-Briggs Type Indicator (MBTI). Introverts lose energy from being around a large group or crowd for a long period. They recharge themselves by being alone. Extroverts lose energy when they are on their own; they like to charge themselves by being around people. It energizes them to be social. Then there are those who lie somewhere in between. This personality type is called as Ambivert. These people posses some qualities of both the extremes. It is not really a simple choice to make after you know your personality type about what career you could be in. it is a means to better understand at what you could be best at. You personality type should also consider your interests and preferences of how you would want to build your life. If you think of yourself as an introvert it does not mean you cannot work as part of a team, you can. If you think you are an extrovert, you can work on your own as well. It is just about setting your priorities and goals and knowing your interests. If you like being the center of attention and talking to people you could choose to become a public relations specialist. As an introvert, in the same field your personality type could suit being a market research analyst. For a career in IT, extroverts could opt to be a computer support specialist where they would have to interact with people to solve their problems. Computer programming would suit an introvert. They will at ease working on ideas by themselves. For an introvert they could choose to be a medical records and health information technician. It requires coding and categorizing with little or minimum interaction. A registered nurse as a professional career in health care would be a perfect fit for extroverts. As it requires being calm with patients, they will be more comfortable working with other people. In the field of finance, being an accountant might be the best thing for introvert provided they are good with numbers, balancing and tax preparation. For an extrovert, being a personal financial advisor would make them outshine since it requires client interactions and dealings. There are certain study areas that are more suitable for online learning than others. For example, if you plan to get degrees that would normally require a lot of practical study instead of theory, you would be better off enrolling in a traditional college. However, degrees in business, nursing and education offered by online schools are quite popular because they are easier to accomplish through online classes. Many students choose to enroll in an online program because they think that these programs are easier and not as demanding as traditional classes. However, this is incorrect. In fact, online classes are just as demanding, sometimes even more than the traditional classes. Online education requires a lot of time commitment as well as discipline. In order to be successful, students often have to spend up to 15 hours a week for a single course. A typical course often requires a student to devote up to 6 hours of study after class each day. Students have to set aside time for assignments, tests and for reading. In online degrees, education format is quite different than traditional classrooms. Students need a computer and reliable internet connection. Work is typically done at home or any other quiet location where they can complete their papers, written assignments and read. They need to take several online tests and quizzes throughout the year. These assignments are then graded and feedback is posted online for students. Students communicate with their instructors through email and participate in discussions with students online. A large number of online degrees today are accredited. In most cases, regional accreditation tends to be most recognized. Online degrees offered by accredited schools are also accepted by most employers. Employers today consider online degrees to be just as valuable as traditional degrees. Students that want to transfer their credits or want to apply in a regular university will have no problems with their online degrees. If the school is accredited, there will be no problem for students to use government sources like federal loans and scholarships to fund their tuition fees for online degrees, just like traditional students. Perhaps one of the best things about online colleges is that they generally do not have an age restriction for enrollment. Students of any age can earn an online degree. In fact, an increasing number of seniors today are taking various degrees online for subjects they always wanted to learn. Although online degrees were looked down upon initially, today the general attitude of employers and students towards online education has changed. With the flexibility, range of choice and affordability that online schools offer, it is a good alternative to traditional education. This field usually has the largest number of students and graduates. It is also worth knowing that many graduates in this field find jobs within a year of graduating from college. Almost every type of company needs people who have skills to help them to be effective. Employers like to hire these individuals because they already have the training to make a business successful. This degree is useful in every industry including manufacturing, design, marketing and healthcare. With these skills you could even go on to start your own business. The sector of computing and information technology continues to grow and the starting salary for recent graduates is increasing. Almost every industry relies on technology to function properly. Many people with information technology degrees earn large salaries not only as workers, but also as consultants for various companies. Other jobs in this field include IT forensic specialist, software developer, network administrator, programmers and web developer. People with this degree work in the healthcare sector and use their skills in various parts of the healthcare sector. They are very much in demand and this is demand is expected to grow by 30 percent by 2030 according to the Bureau of Labor Statistics. A medical assistant can work in both the private and public sectors and in different types of healthcare facilities. Engineers are constantly in demand and according to labor experts, this demand will continue to grow. People with engineering degrees take on roles in management consulting, business managers, patent work, technical work and training and teaching. Engineering graduates usually find jobs quickly after they leave school. A Physics degree can give you the flexibility to choose a number of different career options. It is a very challenging course, but the majority of students find it highly rewarding. The number of job prospects continues to attract students to this field, and they are in high demand when they graduate. Some of the jobs available to people with Physics degrees are teaching, research scientist and telecommunications. They can also find jobs in the oil and gas industry, space exploration and in the defense industry. Any new college student should be careful in exploring their courses and career options. Talking to a campus counselor or family members can be helpful in pointing them in the right direction. However, the degrees listed above offer many career options. Other degrees worth looking at that offers more than one career path include Mathematics, Library and information Science and Languages.